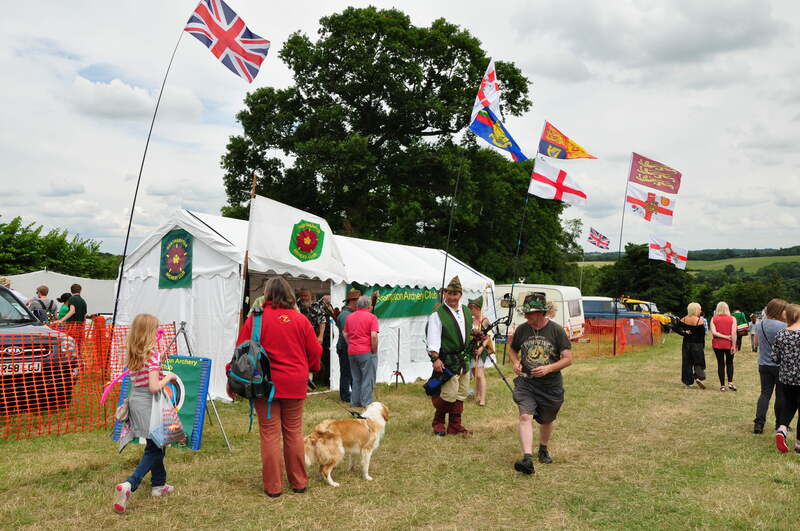 For many years now the NAC have promoted the sport of archery by attending at the Hollowell Steam Rally and encouraging members of the public to “Have a Go” at shooting bows and arrows within a safe environment under guidance. This years event took place over the weekend of 5th and 6th July and we started by gathering at Sywell to load the equipment during the Friday and to take it all to Hollowell where we spent several hours erecting fences, safety netting and gazebos etc in readiness for the 9.00 am start on the Saturday morning. Low and behold the weather was wet overnight and rain was still falling as we got ourselves ready for the rush. Unfortunately the rush didn’t start until much later as the weather improved somewhat after lunch. In just a couple of hours or so the weather improved so much we had a beautiful afternoon and evening where there was a lovely party atmosphere around the site. The rewards on the Saturday was low because of the slow start but with an improving forecast we were expecting much better on the Sunday. As expected we were all delighted as the public started to come into our tent before we were ready for them. This trickle later turned into a very busy day where the weather was kind to us and volunteers were joining us throughout the day which allowed us to take adequate breaks from the shooting line and other jobs and to take a look around the event for ourselves. At around 5.00 pm we started the process of taking everything down and packing it into two trailers which were stored overnight allowing us all to go home for our roast beef and Yorkshire pudding and a well earned rest.On the Monday morning other volunteers joined us at Sywell to replace our equipment into our storage container until the next time. Although this event is at times hard work it is a most enjoyable weekend and it’s so rewarding to see so many happy faces and to get so many inquiries into how to go about joining our club. These event bring a lot of interest as well as some additional revenue which is much needed to help us with our costs. On another point and just for information we can now see how many members of the public visit our website on an average basis. If I was to say we get 112 “hits” a day, how many of us would have thought there is that much interest around in archery and apart from that we also get comments on how good and navigable our website really is..This is just the sought of thing that makes the job so worth it. So thanks to all who do so much for the NAC and a special thank you to all the members and NON members alike who gave their time and effort to support us throughout the period from Friday morning to Monday lunchtime.